You may think nothing of reviewing your Word 2016 document when your vision is good and you can ably use a mouse or keyboard. Not everyone is so blessed. To ensure that you don’t unintentionally create a trap for someone who may not have your same abilities, you can run the Accessibility Checker. As with document inspection, this activity takes place late in the writing and publishing schedule. Seriously, this step should be the first step for any procedure. Click the Check for Issues button and choose Check Accessibility. The Accessibility Checker pane, shown here, appears on the right side of the document window. It lists any parts of the document that need addressing with regard to accessibility. Click to select an individual item. Word highlights the item in your document and displays the reasons why they need addressing. Scroll the Additional Information item in the Accessibility Checker pane to review the fix. 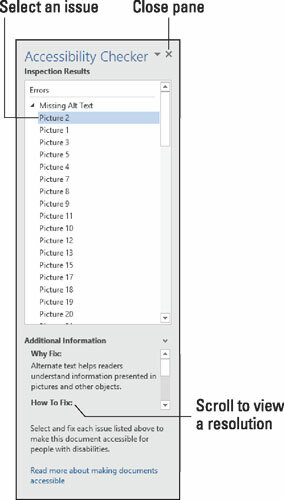 In the case of the Picture issue selected in the figure, the item lacks alternative text. The solution is to add a text description to the image. Continue to review the document; repeat Steps 4 and 5. Close the Accessibility Checker pane when you’re done. Click the X (Close) button. Some of the items flagged for accessibility issues are relevant only for documents you plan to publish electronically, such as an eBook, a blog post, or a web page. For example, the alternative text suggestion shown is irrelevant for a printed document.